Did you ever notice, when some big celebrity retires or dies and the media spends the several days before — or the following several days in the case of a death — telling us all about the great person? Did you ever notice that along with all the interesting things about such people that we usually hear about their religion? It makes sense, doesn't it? Because whatever you think about those big "religious questions," it sort of shows the sort of person you are. I mean, if someone believes in a God that sees to it that everybody gets to heaven, that's a really different sort of person than someone who believes in a God that sends hurricanes and tsunamis in this life and most people to hell after that. So when it was announced earlier this week that Andy Rooney was going to present his last 60 Minutes segment tonight, I listened. Did you know that Rooney got his start in journalism writing for the military newspaper Stars and Stripes? 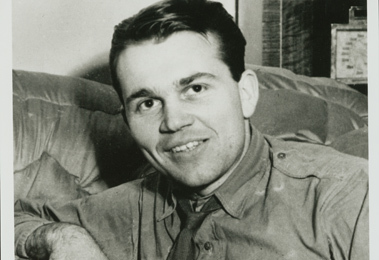 One of his stories, in 1943, was "How It Feels To Bomb Germany." Did you know that Rooney started working for CBS in 1949? That's 62 years ago! Well, the man is 92 now. If you're old enough you'll remember that he's been doing his bit on 60 Minutes since 1978, replacing the "Point/Counterpoint" segment. That was the one lampooned on NBC's Saturday Night Live with Dan Akroyd's famous "Jane, you ignorant … !" Anyway, never in all the interesting things about Andy Rooney in the news this week did I hear anything about the man's religion. Maybe it's because … Rooney is an atheist. Oh, yes, he's made no bones about it. In a 2004 interview that appeared in the Tufts Daily college newspaper, Rooney said the words: "I am an atheist." And he went on to say: "I don't understand religion at all. I'm sure I'll offend a lot of people by saying this, but I think it's all nonsense." And 20-some years before that he responded to a "student" who wrote him asking whether he believed in God: "No, of course I don't and anyone who tells you that there is a god who make his or her presence known to him or her is hallucinating or not telling the truth." "I got a nice letter from Robert Schuller of the Crystal Cathedral in California. He invited me to come out there and speak. I told him I didn't think his congregation would want to hear what I have to say about religion so he wrote another good letter: 'Dear Andy, like it or not, I'm in the "giving a blessing to people" business. So here goes: "Dear God, thank you for believing in Andy Rooney — even if he doesn't believe in you.'" "Pat Robertson says that God has spoken to him and told him that George W. Bush will be re-elected because he deserves to be. … Here's Pat Robertson's exact quote: 'I think George Bush is going to win in a walk. I'm hearing from the Lord that it's going to be a blowout.'" "My question to Mel Gibson is: 'How many million dollars does it look as if you're going to make off the crucifixion of Christ?'" 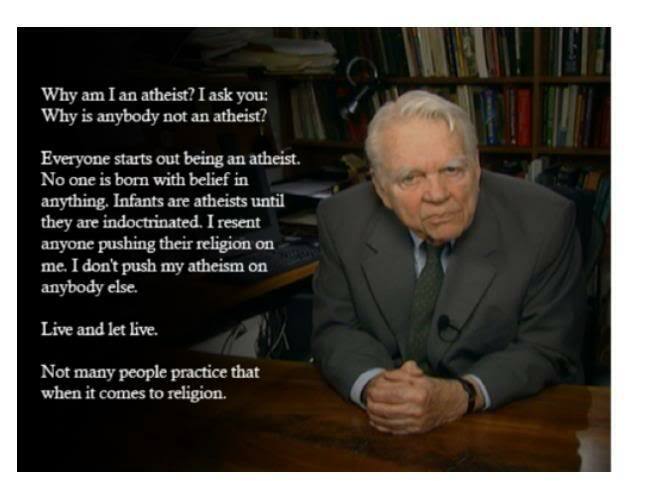 Did you ever notice how much Andy Rooney sounds like a Freethinker? I think it's because he is a Freethinker. 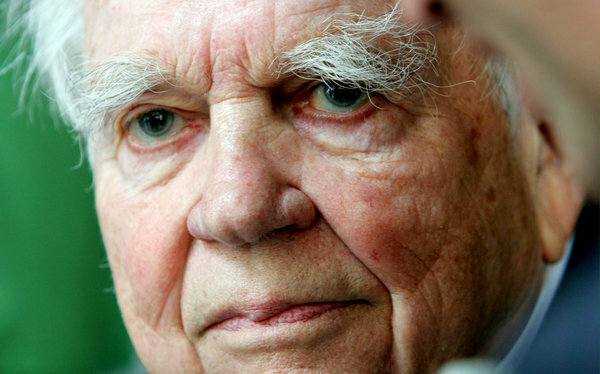 NOTE: Andy Rooney died a month later, on November 4th, 2011, at age 92.